"When you see [an oil] rig like that sitting in the yard, that just means that there's no longer demand to keep it in the field, and there's just not enough work out there for you." The recent oil industry boom was largely due to the emergence of two new oil drilling technologies—horizontal drilling and hydraulic fracturing (or "fracking")—and high oil prices. This boom started during the Great Recession, amid high national unemployment (10 percent in October 2009), and was felt most dramatically in western North Dakota, where employers had difficulty finding enough workers to fill the many jobs created by the boom. Distance and the housing crisis restricted the flow of job seekers to the job opportunities in North Dakota. North Dakota is relatively isolated from large population centers; Minneapolis-St. Paul, the nearest large metropolitan area, is over 500 miles from the Bakken Formation.6 Further, the states that had very high unemployment rates during the recession (the most job seekers)—Arizona, California, Florida, and Nevada—are all well over 1,000 miles away. The housing crisis made it difficult for many job seekers to move to find employment because plunging housing prices left many homeowners "underwater"—that is, owing more on their home loans than they could recoup by selling the house. As a result, they were financially tied to their current location. The boom in North Dakota that produced vast quantities of one valuable resource (oil) left employers searching for another valuable resource: labor. The demand for labor is derived from—or determined by—the demand for the goods and services that the labor produces. 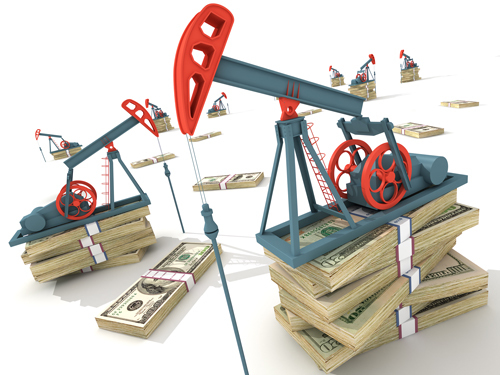 That is, the demand for oil drilling services determines the demand for workers in the oil services industry. The combination of new oil drilling technology and high oil prices provided oil companies with an incentive to drill new wells. Explorations ramped up in 2006 with the discovery of the Parshall oil field, 7 which led to growing interest in the larger Bakken Formation. Oil production in North Dakota grew at least 12-fold from January 2006 (99,000 barrels per day) to December 2014 (1,227,000 barrels per day).8 The relative scarcity—that is, the demand for a resource relative to the available supply—of workers in western North Dakota set the stage for regional labor shortages and higher wages. NOTE: The U.S. unemployment rate rose to 10 percent during the 2007-09 recession (blue line) and has since decreased to 5.5 percent. Meanwhile, the North Dakota unemployment rate peaked at 4.3 percent during the recession and decreased to a low of 2.7 percent (April 2014). The gray bar indicates the 2007-09 recession as determined by the National Bureau of Economic Research. SOURCE: FRED®, Federal Reserve Economic Data. Federal Reserve Bank of St. Louis: US. Bureau of Labor Statistics, Civilian Unemployment Rate [UNRATE], Unemployment Rate in North Dakota [NDUR]. http://research.stlouisfed.org/fred2/graph/?g=13WX; accessed March 31, 2015. NOTE: North Dakota experienced a lower-than-average unemployment rate during the 2007-09 recession. This GeoFRED® map shows the unemployment rate by county in October 2009. SOURCE: Federal Reserve Bank of St. Louis. "Editing the Legend and Changing Colors by Mapping an Oil Boom." https://www.stlouisfed.org/~/media/Education/Lessons/pdf/GeoFRED-Mapping-an-Oil-Boom.pdf, p. 8; accessed March 12, 2015. 6 The Bakken Formation covers 200,000 square miles and underlies parts of Montana, North Dakota, Saskatchewan, and Manitoba. Oil was first discovered there in 1951, but the technology to extract it was introduced only recently. 7 The Parshall oil field, near the town of Parshall, North Dakota, draws from the Bakken Formation. The discovery of the Parshall oil field in 2006 is often marked as the start of the North Dakota oil boom. 9 Federal Reserve Economic Database (FRED®). "Unemployment Rate in Mountrail County, ND [NDMOUN1URN]." http://research.stlouisfed.org/fred2/graph/?g=11wx; accessed March 31, 2015. 10 FRED®. "Unemployment Rate in Williams County, ND [NDWILL5URN]." http://research.stlouisfed.org/fred2/graph/?g=12TQ; accessed March 31, 2015. 11 FRED®. "Resident Population in Mountrail County, ND [NDMOUN1POP]." http://research.stlouisfed.org/fred2/graph/?g=12TK; accessed March 31, 2015. 12 FRED®. "Per Capita Personal Income in Mountrail County, ND [PCPI38061]." http://research.stlouisfed.org/fred2/graph/?g=12TL; accessed March 31, 2015. 13 FRED®. "Per Capita Personal Income in Mountrail and Williams Counties, ND [PCPI38061, PCPI38105]." http://research.stlouisfed.org/fred2/graph/?g=12TP; accessed March 31, 2015. 14 FRED®. "Crude Oil Prices: West Texas Intermediate (WTI)—Cushing, Oklahoma [DCOILWTICO]." http://research.stlouisfed.org/fred2/graph/?g=12Ug; accessed March 31, 2015. 15 North Dakota Industrial Commission, Department of Mineral Resources. "Current Active Drilling Rig List." https://www.dmr.nd.gov/oilgas/riglist.asp; accessed April 3, 2015. Relative scarcity: Demand for a resource, good, or service relative to the available supply of that resource, good, or service.